The Mobius Strap | How Do I Use It? INSTRUCTIONS are for right-handed players. Directions should be reversed for left-handed players. UP, UP AND AWAY! : Start with the instrument on its back with its neck to your left. Grasp the end of the strap opposite from the end with the plastic parts and hold it with the Velcro facing UP. Feed it AWAY from yourself under the strings, back and beneath the ukulele body until you have both ends completing a loop in front of you. There should be no twists in the strap and both Velcro strips should be facing UP. KEEP RIGHT! : Now turn the strap end that you fed around the instrument over to the RIGHT so that the Velcro strips are facing each other and press them together. Notice that the strap now has a half twist in it. This is by design! The twist in the strap will disappear when you put it on. If you twisted the strap the wrong way it will have a FULL twist when you put it on. Reverse it one whole turn and try again! ALWAYS FORWARD! 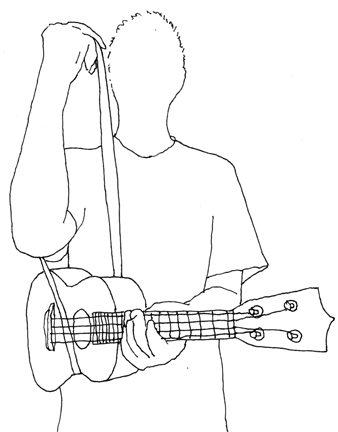 : Hold the ukulele with your left hand with the neck pointing FORWARD, away from you. Grasp the strap by the area of the Velcro strips with your right hand. 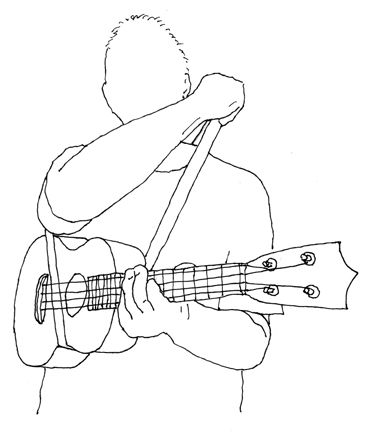 Lifting the strap up, put your right elbow FORWARD (toward the neck) through the opening. Continue to lift the strap over your head and let it down to rest on your left shoulder. VOILÀ! : The lower portion of the strap should cradle the instrument at its waist on the bottom. 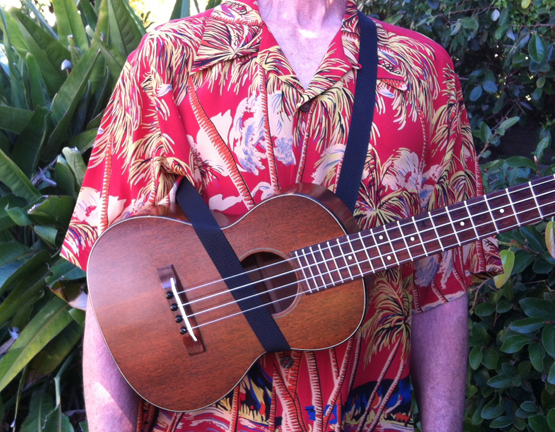 If the strap is adjusted to the correct length, the neck of the ukulele should be level or a little above. If it is too low, tighten the strap or vice versa. If necessary, slide the strap around your shoulder to position the plastic parts away from the instrument. With a little practice, putting it on will become second nature! That's it! Enjoy your Mobius Strap! Q: Will it work on my ukulele? 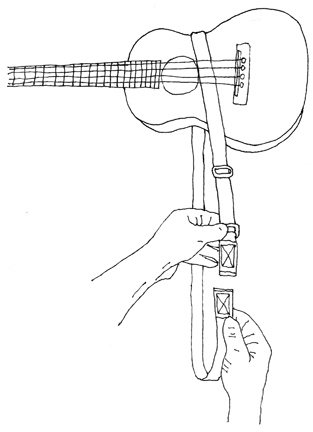 A: The Mobius Strap for Ukulele will work for most people, male or female, right or left-handed, on any size ukulele that has a waist, with the exception of some metal-bodied resonator instruments, which may be too "bottom heavy" to balance properly. Q: Will it affect the sound of my ukulele? A: The strap puts no pressure on the soundboard and tests with a decibel meter show no effect on volume. Q: Can it dampen my strings? A: When playing while standing the weight of the instrument prevents this from occurring. 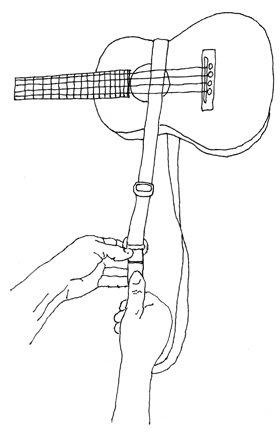 When playing sitting down it is possible to take the weight off the strap allowing it to touch the strings. However, if properly adjusted you can play sitting down without this happening, as shown in this video. Q: This can't be right! What am I doing wrong? A: There are two possible ways to put on the strap but only one is correct. Make sure you are putting your arm through toward the neck of the ukulele. Q: This isn't comfortable! What's wrong? A: If you turned the strap the wrong direction to connect the ends you will wind up with a full twist in the strap when worn. Right-handed players should turn it to the right, left-handers to the left! If it is wrong, reverse it one whole turn and try again. Q: Why isn't this working on my pineapple ukulele? A: Your ukulele must be the type with a waist for the Mobius Strap to work properly. The waist positions the strap to act as a fulcrum with the weight of the neck holding the instrument in playing position. Q: Why isn't this working on my metal-bodied resonator ukulele? A: Some metal-bodied resonator instruments may be too "bottom-heavy" to balance properly. The instrument should be heavier toward the neck when balanced at the narrow waist for the Mobius Strap to work correctly. Q: Will it work on my guitar? A: There is a special version of Mobius Strap for Classical, Flaminco, Gypsy Jazz, Mariachi or Vintage Guitars. For nore information or to order, please click here.